On Thursday October 1st, I happened to have the day off and noticed on twitter that Infowars would be joining a counter protest against an organized anti-gun rally on the University of Texas campus. 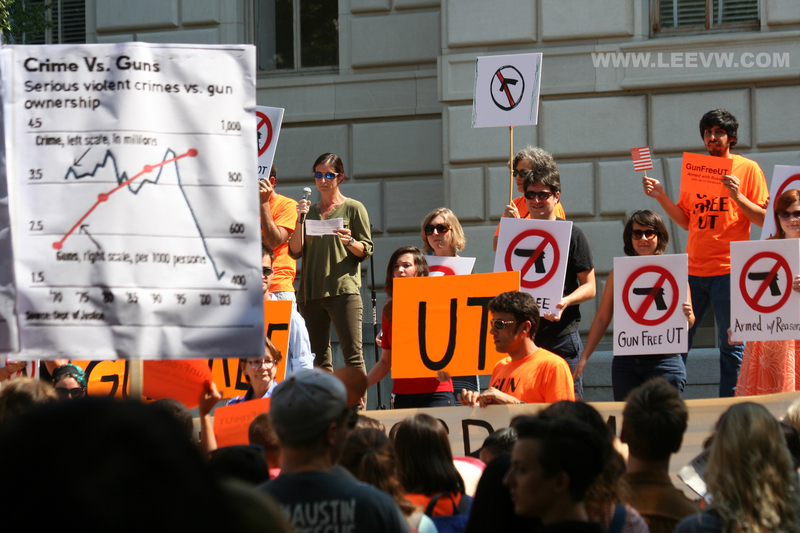 A recent piece of gun legislation was passed, opening the door for those with concealed carry permits to potentially carry weapons on campuses in Texas. I am of the opinion that gun ownership isn’t simply afforded by the Constitution but the foundation to a free and just society. I took along my camera, wore an appropriate t-shirt, and forced myself to elevate beyond arm chair activism. For many years I have relegated my opinion to Twitter and Facebook, and the occasional monkey themed comic. I arrived just after two men were arrested for holding signs in the wrong place and for believing more in the sanctity of the 1st Amendment than the requests of the police. Apparently you can pay to remove free speech from certain public areas and have the police enforce it. I don’t think I’m at that level of protesting just yet, this was in fact my first rodeo. I witnessed some very passionate arguments and some not so intelligent fear mongering platitudes. Far too often the arguments made by representatives of a Gun Free UT were laden with anecdotes, fear, and a dash of identity politics. In full view of the infamous UT clock tower, the speakers felt it necessary to invoke that tragedy and others ad nauseam. I didn’t hear one speaker ‘armed with reason’, the slogan on their shirts, but each had plenty of fear to peddle. One speaker rhetorically asked the crowd if they wanted guns on campus, 20 feet from the 13 armed police officers protecting him from dissenting signs. It is a ludicrous notion to think such a gun free campus is even possible. How well are the ‘drug free campus’ or ‘dry campus’ initiatives working? Maybe it was because they were facing into the sun, but most of the #gunfreeUT campaigners lacked any sense of real passion. Maybe they were simply attempting to affect a somber mood, but, from their speeches, their posture, and the looks on their faces, many seemed like they were just sick of their job. 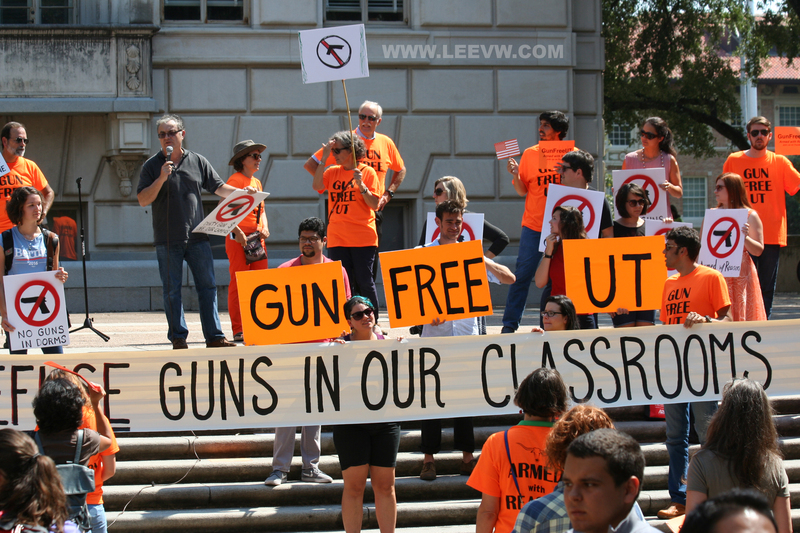 The few students that were roped into wearing a shirt or holding a poorly drawn gun sign looked beyond bewildered. 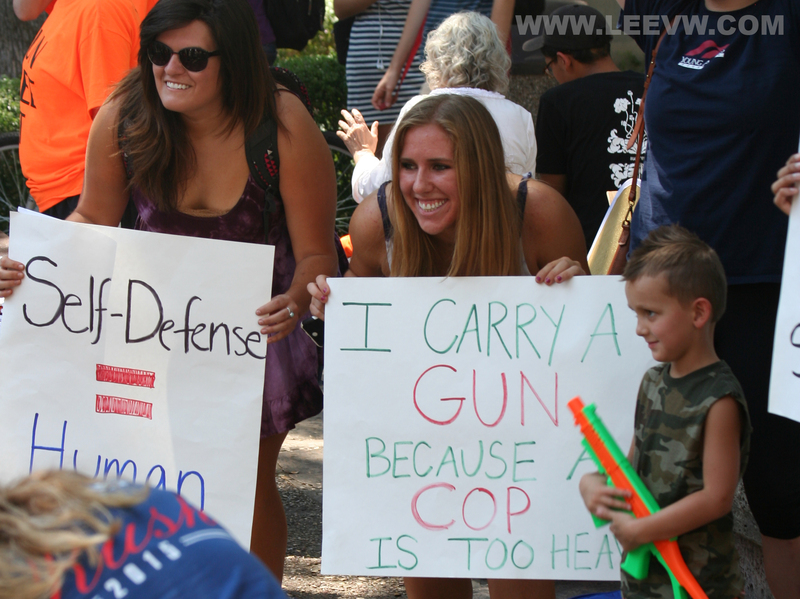 Conversely, the counter protesters were armed with statistics on signs, better slogans, and big smiles like the girl with the ‘can’t carry a cop’ sign. Freedom and promoting freedom seems to have an invigorating effect. The gun ownership vs. violent crimes graph sign was great. Implying a causal relationship with any two line graphs isn’t always the most accurate form of evidence, however, when the graph so succinctly counters the appeal to fear argumentative fallacies being spouted on stage that ‘more guns equates more violence’ the sign becomes a swift smack to the mouth. Many of the speakers lamented that concealed carry campuses will become the ‘wild west’ and shootouts would become common place in the same breath they lamented that shootouts were common place on gun free campuses. These claims weren’t backed with evidence, they were just assumptive, fear based remarks. In a likely attempt to wear UT orange, they seem to have settled for prison orange, an unwittingly fitting choice for the path that their type of rhetoric will lead a campus towards, closed off and prison like, with students preemptively being treated like criminals. A friend of the two arrested, this red white and blue dressed gentlemen, was very passionate about the right to carry a gun. 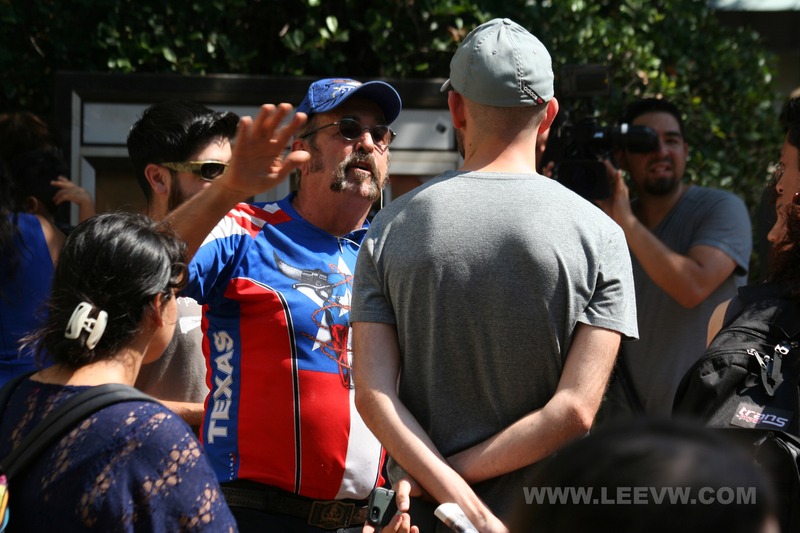 He refers to himself unsurprisingly as Captain America, and seemed well known to the Infowars crew reporting on scene. Admittedly, he was a bit outlandish to me at first, but when juxtaposed to the prison orange and fear mongering of the gun free crowd he was rather tame, and after a brief talk, a generally nice and charismatic dude. He wasn’t just passionately debating. He handed out a few smiles as well. I by no means endorse the totality of who he is or his platform, having only the mere minutes worth of interaction with him from that day, but he left a hell of a first impression. Here is some more pictures from that day. I don’t claim to know what will and wont reduce mass shootings. I am open to debate on this issue and will explore some ideas of my own here on the State of Leeland on how it might be accomplished. I do know, however, that any limitation on personal sovereignty, no matter how well meaning, is fundamentally immoral. I will do what I can to shed light on tired old draconian tactics no matter what new branding is created for them.